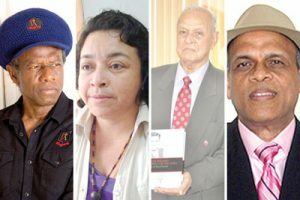 The University of Guyana’s academic board has for the first time approved a decision to confer Honorary Doctorates on four distinguished Guyanese. The board recently approved the petition from Vice Chancellor Ivelaw Griffith to confer Honorary Doctorates on the internationally acclaimed singer Eddy Grant of ‘Electric Avenue’ fame; Amerindian rights activist, Laura George; astute businessman, Yesu Persaud; and U.S based realty businessman and philanthropist, Jay Sobhraj. The University has faced a backlash for embarking on the course to award honourary doctorates at this time. Former Dean, Faculty of Social Sciences at the University, Mark Kirton said he was disappointed that the Chancellor and the University Council have approved the award and recommended an immediate reconsideration of the decision. From L-R: Eddy Grant, Laura George, Yesu Persaud and Jay Sobhraj. “While I have no problem in principle with the award of honorary degrees, the award of an honorary Doctoral degree from a university which has never awarded an academically earned doctoral degree is highly irregular and must raise concerns,” Kirton stated publicly. He cited that universities usually confer their highest degrees to persons who, though not completing academic degrees, have in their own fields distinguished themselves with the rigour which can be considered equivalent to the university’s highest academic degree holders – the Ph.D graduate. However, the university has pointed out that at present, the Doctor of Philosophy in Biodiversity (PhD) is offered in the Faculty of Earth and Environmental Sciences, in partnership with the Faculty of Agriculture and Forestry and the Faculty of Natural Sciences. This programme was approved by the University’s Academic Board in 2015, before the arrival of Vice-Chancellor Griffith, and the class comprises students from Belize, Fiji, Jamaica, Suriname and Guyana. “Notwithstanding that fact, a university does not have to be a doctoral granting institution to confer honorary doctorate degrees,” the university argued. The university cited that on July 24, 2017 the University of the Commonwealth Caribbean in Jamaica conferred the Honorary Doctor of Business Administration on Gary Hendrickson, CEO of Continental Baking Co. Ltd in Jamaica, in recognition of his achievements in Business and Industry. Further, on July 1, 2018 the University of the Southern Caribbean in Trinidad and Tobago conferred an Honorary Doctor of Humane Letters on Dr. Walter B.T. Douglas for his dedication to Christian Education. UG noted that that the University of Guyana Act, which dates to 1963, in the section that pertains to the power to confer degrees, 18 (e); grants the University the legal authority “to confer Honorary Degrees and other distinctions, provided that all degrees and other distinctions so conferred shall be conferred and held subject to any provision which are or may be made in reference thereto by the university”. “The honour recognizes his work in founding the Jay and Sylvia Sobhraj Foundation, which, this year, helped create the nation of Guyana’s first degree programme in psychology, as well as a new building and resources to house mental health services at the university,” the statement said. It further recognizes the foundation’s work in creating scholarships for students to attend the university, its purchase of equipment for the Guyana Police Force, as well as for the specialized high school preparatory classes it runs for hundreds of public school students in Queens.